Bob Schertz recalls the Metamora Bands in the April 17, 1997 Herald.. The Metamora Herald recently ran a picture featuring the Metamora Military Band with 18 musicians hold­ing a variety of wind band instruments. Wind band instruments require a mouthpiece as opposed to stringed instruments found in a symphony orchestra. We correctly identified some of the musicians in this picture, but we also made some errors. The fact is that 80 years after any picture is taken, it will be almost impossible to know some indi­viduals, unless identification is some­how otherwise provided. Publishing the picture did, however, produce some pos­itive response. The picture described was mailed to my wife by a distant rela­tive from California. We have been able to identify eight of those pictured. Jeanette Christ from Washburn has now made available another photo of the Metamora Military Band taken in front of Isch's store. There are about the same number of musicians, and it must also have been taken during the period 1910 to 1920. With the help of family members and relatives we are able to name 10 of those pictured. The existence of another wind band known as the Attig Concert Band from Lowpoint has come to our attention through the help of Ruth Attig Cross. Of the 19 musicians pictured we have so far identified six, and they are all Attigs, a name that was very prominent in the musical history of the Metamora area. There is evidence of the formation of bands going back to 1866. As proof of this, turn to page 33 in the 1964 edition of the "Old Settler's Association Souvenir Book" published that year. You will find a photo plainly labeled Band in Metamora, Illinois - 1866. Pictured are 11 musicians holding their instruments. Last names include Irving, Graham, Neve, Causey, Lineweber, Wilson, Portman, Waldon, Ellis, Fordyce and Crane. Kuhl is named but was absent when the picture was taken. Many will recognize some of those as being part of earlier history in Metamora. It is an historical fact that the first settlers came to this area about 1830. You may wonder, is it possible those early pioneers formed a brass band just 36 years later? I will let the facts speak for themselves. Picture, if you will, the Wells-Fargo wagon pulling into town loaded with instruments for the newly-formed boys' brass band. Now turn to page 24 in the 1966 edition of the "Old Settler's Association Souvenir Book" and you will find a piece written by Mae Walden, daughter of T. D. Walden, an early local business- man in Metamora. She writes, "Many of the pleasantest recollections of my childhood clustered around the old bandstand. What good times we used to have on the Fourth of July, political rallies, and days of the County Fair." Remember, Metamora at one time was the county seat for Woodford County. Mae continues, "Circuses and medicine shows pitched their tents here until the 1890s. There ought to be in some of the old albums in Metamora a picture of the Metamora Cornet Band. It was taken by photographer Sam Powell and when I was a child almost every .house had this (post) card photograph. There were no uniforms worn except some caps. Members of this band listed by name include the leader Joseph Ellis, Nick Portman, Charlie Crain, Newt Fordyce, Gord Wilson, Tom Causey, snare drum player Cass Irving, Harvey Kuhl, Joseph Lineweber, Bob Moreland and Ed Neve. You will note many of these names appeared in the 1866 band roster. Mae writes on, "But the band -wagon! Never shall I forget its red and gold splendor, shaped like a galley boat, and drawn by four white horses with red harness and red plumes at their ears. The whole outfit was driven by a wonderful man by the name of Saul Allen. He was employed in the livery stable, run by George Kern, and he ran the bandwagon as a bus to and from the fairgrounds several times a day. The fare was five cents." Quoting from the souvenir program, "It is not known when this band was discontinued. The Metamora Military Band was organized in 1889. They played for all occasions including the First Communion at St. Mary's Church that year." Also, pictured on page 24 of the 1966 Old Settler's program is an early Metamora Military Band picture includ­ing Stivers, Bill Meister, Harry Martin, Carl Hindson, Gerich, Roy Wagner, Ed Gerich, Henry Parker, Bill Broenle, Robert Martin and Pomp Martin. We now know that a brass band was established as early as 1866, and the tradition has been carried on up to our time, with band music flourishing into the 1900s. Many of us have seen interest in band music evolve over the decades, up to the introduction of what we know as the Metamora Municipal Band and the Attig Concert Band. This must have occurred about the same time or slightly later than the Metamora Military Band. My recollection of one of the earliest leaders was Glenwood Tanton. His sons, Bill and Henry "Bud" Tanton, told me Glenwood played solo clarinet with the famous John Philip Sousa Band for about one year in 1918, while serving in the U.S. Navy. Sousa, though much over age for military service during World War I, was commissioned as a Lt. Commander in the U.S. Navy, and con­ducted the Great Lakes Naval Training Station Band. Many fine musicians and entertainers performed in that Special Services Group. Other Metamora Municipal Band leaders over the years were George P. Thompson, George Haecker, Mrs. Fred (Lucille) Stephenson, Jim Wiltz, Ron Donaldson, Russ Vroman, Dan Gannon and Mike Domico. Fred Stephenson probably directed the Metamora Municipal Band at one point. He was also an excellent cornet player, and was part of the famous Freddy Stevens Dance Band, well-known to the Peoria area. Fred Stephenson was band director and taught mathematics at Metamora Township High School for 11 years until 1954. He was also a naval aviator during World War II. Almost as important as the leader of the band were the business managers. Starting very early on was Carl Hindson, who also played clarinet. Then came Graydon Parker, who played baritone. A special treat was Graydon often singing at the end of a concert in that beautiful tenor voice "Till We Meet Again" with band accompaniment. Many lovely summer night concerts in the park were finished that way. My instrument was the trombone, and by the time you reached high school you were eligible to join, in addition to the high school band, the Metamora Municipal Band It was kind of like you were coming of age. You were accepted into the brother­hood of musicians. It was heady stuff for a young boy or girl to come to the Thursday night rehearsal in the Village Hall, or in the park if weather permitted, and take your seat by a seasoned and mature player. There was a lot to be learned from this corps of experienced personnel. The brat time the band played "Lassus Trombone" I was sure I was in over my head. There was no need to be concerned because when you are sitting two or even three seats deeper in the section from someone like trombone player Ben Schneider, you are going to learn a lot about music, and you are going to enjoy it. Ben was awesome, and not only on the trombone. He also played cornet, baritone and even oboe toward the end of his career. Playing more than one instrument was not uncommon in those early days. like, for example, the Attig boys. Rudy Attig played cornet and alto horn. He loved to play a number called the "Klaxon March", one of the few marches featuring an alto horn solo. Rudy also played violin, and might even have been best known for playing the musical saw. Rudy had a brother, Ralph, who played cornet. Ralph was director of the Attig Concert Band, composed mostly of family members. His daughter, Ruth Cross, told me Ralph thought teaching his father, Sam, to play trombone, and other members of the band to read music and play various instruments, was the most significant event in his life. Ralph's uncle, Ed Attig, had previously taught him to play. Sam had a brother, Fred who played French horn. Fred Attig's son, Lloyd, played cornet. Some of these men played more than one instrument, and played them well. Ralph and Rudy s brother Floyd, played cornet. Ralph Attig had two daughters, Ruth and Joan, who sang in a sisters' act called the Attig Sisters, often singing and entertaining at the Saturday night band concerts in the park. The Metamora Herald reports they stole the show with several songs they sang at one of these events. Over the years, Metamora spawned some outstanding musicians. Most had high school experience, and then went on to the Metamora Municipal Band, and in some cases to other opportunities. This list would include cornet players Bob Grob, Leland Cross, Carlyle Regele, Durward Guth and Walter "Bud" Christ. Baritone players who come to mind include Bob Garber, Donald "Doc" Weyeneth and Ron Schertz. Bob Hornbeck played percussion for many years, and still plays with the Gus Gustafson Band. None of us will ever forget baritone player Maynard Christ who later developed Snag Creek Golf Course. When the band played the old circus number Barnum & Bailey's Favorite, you knew you were in for a ride. You had to be an extremely athletic musician to handle this particular piece, and Maynard did it with great skill. He entered military service in 1942 with Melvin Greennagel, bass player, and both of them played with the band at Camp Robinson in Arkansas. When that band was bro­ken up, Maynard became an infantryman, serving in Europe. Melvin Greennagel was another very talented musician. He is now retired and living in Virginia near Washington, D.C. Mel told me on the phone recently that one day my father, Ray Schertz, who was high school principal at the time, called him to the office. Mel said he had reason to be somewhat concerned, because as any former student will tell you, Dad had a reputation for being a tough disciplinarian. During that visit to the office, Dad asked Mel if he would like to play the bass horn in the band. Mel agreed to do it, and that launched him in what became a 27-year career playing the bass horn in, and later serving as sergeant-major of the U.S. Army Band, based in Washington, D.C. During World War II, Mel traveled extensive­ly with this band, both entertaining troops and in a ceremonial capacity. Following the liberation of Paris in the fall of 1944, the U. S. Army Band marched down the Champs Elysee past the Arch de Triumph, leading elements of the 1st and 3rd American armies along with the 12th Army Group. Films of this parade showing the massive formations of U.S. Army troops participating in this event at that time in our history are very moving and most impressive. When it came to bass players, God was obviously pleased, and blessed Metamora with some great ones. Henry Parker was followed by Melvin Weyeneth. Eldon Hirstein played for many years, as did Willis Hodel. There is a great old standard piece of band music, still often performed today, called "Them Basses". The trombones and baritones join the basses, and most musicians love to play it, especially with a Willis Hodel leading all the other sections. Willy went on to play with an Army band at Ft. Sam Houston in San Antonio and later at Camp Pickett in Virginia. 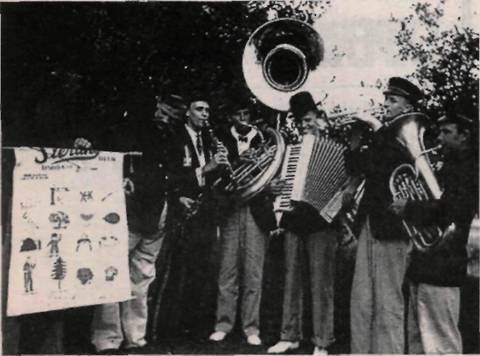 In the late 1930s Metamora was treated to yet another musical group. It was called the Metamora German Band. One of the musicians in this group was DePaul Grieser, who played clarinet. His greatest calling in life came later when he became Fr. Aubert, a Catholic priest. DePaul was a virtuoso clarinet player, and organized the German Band. Lee Cross played cornet. During World War II he was in a band with the U.S. Army Air Corps. He later married Ruth Attig, one of the Attig Sisters men­tioned earlier. Maynard Christ played baritone. Mel Greennagel played bass. Don Heinnigus played clarinet, and Chuck Washburn played accordion. The vocalist and oft-times master of ceremonies of this group was the legendary Bill Briggs, a man so talented he was in a class all by himself. He loved the town of Metamora, and as a ham radio operator was often heard to sign off saying, "Metamora is easy to find, hard to leave, and was Abe Lincoln's and my home town." He had a beautiful deep bass singing voice. Bill's vocal rendition of "Old Man River" was unfor­gettable. This is part of the story. There are many fine musicians out there. We have tried to focus attention on some of them. Many communities still enjoy strong municipal band programs. Some that come to mind are the Naperville, Illinois Municipal Band, the Wheaton, Illinois Municipal Band, the Blossom Festival Band in Cuyahoga Falls, Ohio, the Allentown, Pennsylvania, Municipal Band, and, of course, the Peoria Municipal Band. The Metamora Park District each summer sponsors popular musical events in the bandstand in the park, every Friday evening, playing to large crowds. Murllene Kramer has been instrumental in organizing these, and is master of ceremonies. The Gus Gustafson Band is a favorite in this venue. Greatly appreciated is Mike Domico’s current effort to re-ignite local interest in band concerts, following the great tradition of wind bands in Metamora. We all agree life would be much less interesting without music, and wind or brass band music seems to be where much of it began. In a letter written by May Walden, sister of J. F. Walden, an early Metamora jeweler, the following early history of the organization of the first band of 1871 is described. Early in 1870, the townspeople organized a Might (mite) society which met in different homes and raised small sums, from $4.15 to $6.20 at each party to pay the band members. Names of entertainers in the band were Nick Portman, Mrs. Barnes, Mr. Chitty, Mrs. T. B. Spiers, Zack Whitmire, Wm. Whiffen, John Perry, George Kern, A. H. Kinnear, John Hays, John Clark, Isaac Wikofff, Wm. Cassell and Wm. Lamson. Taken from the August 12, 1955 Metamora Herald. Dear Mr. Graydon Parker: One more summer has come and gone and this is about the first time in more than 40 years that I have not played or attended your Saturday evening band concerts. I have had plenty of time this summer during my recent illness to think back over the years and realize the part our community band has had in making our weekly concerts a success and in furnishing entertainment for the people of this community, and trying to recall the different directors we played under. I have a picture of what is known as the first Metamora band, taken in 1866, which includes such names as Gordon Wilson (my grandfather), Tom Causey (Fred’s father) and several other old-timers whose names I recall, and a young man playing snare drum named J. C. (Cass) Irving, who was only 16 years old at that time. He was born in 1850. Years later we often called on Cass to help us out when we needed a drummer but he is the only one from that group that I played with because that was a little before my time. My first experience with the band was around1900. My uncle, Lee S. Wilson, a Metamora boy who had gone to Peoria to work, was out of a job due to the depression of the 1890’s and had moved back here and started a band at that time. He even wrote some of the music. He was a natural born musician and a wonderful director, but he had very little to work with. Money was very scarce and many of the young men who wanted to play in the band had no instrument, but the band survived and it was only a few years until he returned to Peoria and for 20 years he directed the First Methodist choir of 70 voices, considered one of the best in the state. After he left us, the band went along about as follows. Charlie Reynolds moved here and operated the blacksmith shop just north of the bank building. With him came your father, Henry S. Parker, who played bass for years and years and was one of the best. Charlie stayed only a few years, so we were in need of another director. I think Ed Gehrig was the next in line and he had the band for several years. Then we had H. L. (Bert) Dyar, who was not only a good director but a wonderful all around good fellow. Then during 1912 to 1914 “Yours Truly” was the director and I have a picture taken on Old Settlers’ day, 1912 to prove it. Then came Mr. Monroe from Peoria, Fred Elgin, director of Elgin’s Peoria band; George Haecker, G. C. Tanton and then George Haecker again. During the recent five or six years you had Mr. And Mrs. Fred Stephenson, then Carl Webb and James Wiltz and this year it was George Haecker again. There were a few years mixed in where we had someone from Lowpoint and Washburn but for only a short time. Some of us old-timers were always helping out the Roanoke, Eureka and Washburn bands and they in turn would come and help us out on concert nights and in that way we had a better band. Dave Wilson of Roanoke and George Haecker of Eureka did much to keep their community bands in operation. I had my own dance band from about 1910 to 1925 and some of my musicians who went on to make a name for themselves were Louis Broaddus of Varna, Alvina Knoblauch, Glen Gray, Mabel Malone and no list would be complete without the name of Carrie Knoblauch Schertz who played with me off and on for years and was tops playing the piano in a small dance orchestra. I want to give credit to all of the members of the band, and especially the older ones who played year after year for very little pay, but to you and Carl Hindson we must give credit for keeping the band together, because without your help and determination I am almost sure we would have no town band today. Carl worked hard to get the band tax passed a few years ago which hurts no one and gives the band a little income upon which to operate. Before that you had to depend upon free will offering from the businessmen. No band ever had a better booster than Bill Ryan, who has always published your programs and advertised the weekly concerts and you could always find Bill and Mrs. Ryan in the park on Saturday evening. Carl is no longer with us, but once again I want to congratulate you two men for the wonderful job you have done and hope that you will continue to carry on from here, and maybe next year I will be able to hear you play “Barnum and Bailey’s favorite march” by K. L. King, which is my favorite march. Yours sincerely, Harry G. Martin. Taken from the Metamora Herald issue of November 29, 1957.